For the first time in over 50 years, the major Holy Week liturgies will be celebrated in the Diocese of Gary, Indiana, this year, thanks to a new apostolate of the Institute of Christ the King. 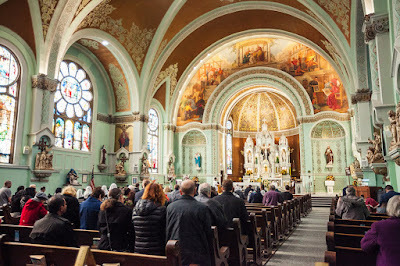 The church of St Joseph, located at 5310 in Hammond, Indiana, will hold the ceremonies of Palm Sunday, Holy Thursday, Good Friday, the Easter Vigil, and of course Easter Sunday. The following schedule has been announced on the church’s Facebook page; further information is available at the website of the Northwest Indiana Latin Mass Community. April 14th, Palm Sunday: High Mass with Blessing of Palms and Procession, 11:00 a.m.
April 18th, Holy Thursday: High Mass at 7:00 p.m., with Adoration until Midnight. April 19th, Good Friday: Stations of the Cross, 8:00 a.m.; Mass of the Pre-Sanctified, 6:00 p.m.
April 20th, Holy Saturday: Blessing of Easter baskets and food, 7:15 p.m.; Easter Vigil 9:00 p.m.
April 21st, Easter Sunday: High Mass, 11:00 a.m.